Can soil from a contaminated site be used (disposed of) at a Paragraph 19 Exempt site…? Yes, but you must initially prove that the soil is non-hazardous and secondly that it is suitable for use. The latter must be done by providing sufficient evidence to demonstrate that it will not cause pollution or harm. An assessment of environmental risk (using Drinking Water Standards and Environmental Quality Standards as appropriate) in relation to the specific hydrological setting of the exempt site. Coupled with the above, SEPA require that all data sets pertaining to the site, no matter how old, must be used in the assessment of the risks. Whilst this is a different position to that normally adopted by the regulator for contaminated sites, (the local Council Contaminated Land Officer) it must be understood that SEPA’s stance is from that of a waste regulator, which is subtly different, hence the requirement to use all available data sets. So if you have a non-hazardous soil passing inert WAC do not simply send it to a Para 19 Exempt site as you could be prosecuted for doing so…! 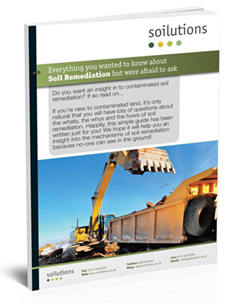 Classification and disposal of contaminated soil…? “Everything you wanted to know about Soil Classification and disposal options but were afraid to ask”…coming in an e-book soon…and it’s free…! So, once you’ve correctly classified the soil, and can justify the classification, you then need to consider the Waste Acceptance Criteria (WAC) test results that should have been undertaken on your soil samples. Please note that WAC is not a soil classification but a means of determining the appropriate landfill site. A landfill site is a facility which has been granted a permit to dispose of certain waste streams according to the licence specifically granted for that site. The EU Landfill Directive 1999/31/EC1 requires that all landfill sites must now be classified as either hazardous, non-hazardous, or inert. Non-Hazardous and it has leachability characteristics that are below the limits for inert WAC; i.e. it is below the inert WAC limits, then it can be disposed of at an Inert site. It can also be disposed of at a Non-Hazardous or Hazardous landfill site but this will cost you a lot more. Are you mad…! Non-Hazardous and it has leachability characteristics that are above the limits for inert WAC then it can be disposed of at a Non-Hazardous landfill site or indeed a Hazardous site, providing it is below the Hazardous WAC limits and you’re willing to pay the higher gate fees. There are no WAC limits for Non-Hazardous landfill sites but certain Non-Haz sites do have specific limiting criteria, i.e. they are limited to what they can accept. Hazardous and it has leachability characteristics that are below the limits for hazardous WAC then it can be disposed of at a Hazardous landfill site. Hazardous and it has leachability characteristics that are above the limits for hazardous WAC then pre-treatment will be required before it can be disposed of at a Hazardous landfill site or indeed reclassified. If you do pre-treat it may be possible to reclassify the material as the treatment may have significantly reduced the contaminants of concern. * Individual sites may have certain limit values predetermined in their licence. ** After pre-treatment the material characteristics may have changed to an extent which allows for it to be re-classified as a Non-Hazardous waste. These sites are NOT Inert Landfill sites. They are sites which have been granted an exemption from holding a waste management licence as they have a requirement for material for the construction, maintenance or improvement of buildings, roads, railways, airports, docks or other transport or recreational facilities. Their need is for a given amount of material, at a specific location for a dedicated reason. Simply filling a hole in the ground does not count unless the end use is for one of the above reasons. It may be possible to deposit contaminated soil at Para 19 sites but suitable evidence must be produced that demonstrates that the soil will not cause pollution or harm. The only real way of achieving this is to undertake a detailed risk assessment that considers the risk to humans, the site and any neighbouring receptors whilst considering the soils in question, which can be quite expensive to undertake…! Please note if you employ someone to undertake the removal or treatment of soil on your behalf all responsibility for the waste including where it ends up, continues to be yours…it’s your duty of care…you’ve been warned…! Also anyone who undertakes a ‘disposal operation’ or ‘waste recovery’ i.e. treatment of soil, is required under Articles 9 and 10 of the Framework Directive on Waste (Council Directive 75/442/EEC) to obtain a permit from the competent authority. Or you could phone us as we might be able to accept it at our soil treatment centre.